T-C12H Easy Self Lock Big Knob Clamp - Pro Low Profile Hook Style Clamp for 2 inch Truss or Pipe. Maximum load of 330 lbs. The ultra handy light clamp was designed to save precious set up time while offering a low profile design for a high-end, contemporary look. The best feature about the Easy Big Knob Clamp is they were made specifically for lighting and effects installations by a single person. Use of the Easy Self Lock Big Knob Clamp is quick and most of all easy! 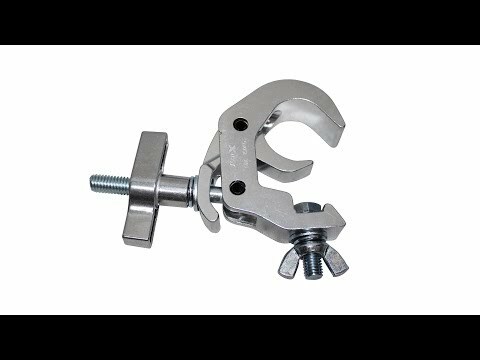 Easy Self Lock Big Knob Clamp offers a hook, low profile design, and self-locking mechanism, it's so easy and simple a single person can rig lighting and effects equipment onto trussing or pipes. The Easy Big Knob Clamp's innovative design is ideal for everyone from mobile DJ's who set up usually on their own, to churches to large productions eager to ease setup time and labor costs. Once again only a single rigger is required to climb ladders and attach each light and/or effect, Easy Self Lock Big Knob Clamp can offer a significant cut in setup time and costly labor with each and every project saving you big bucks in the long run. Shallow-fitting clamp also provides a contemporary, professional look by holding lights closer to the trussing. With less obvious gaps between truss and equipment, it’s never been easier or simple to achieve a high-end look.